A microbiologist producing sustainable proteins from micro-organisms and a technician who developed a robot for automated harvesting in greenhouses: just two of the eight promising high-tech startups selected to participate in the second StartLife Accelerate Program. It is the first program in the Netherlands entirely dedicated to supporting young food & agtech entrepreneurs in validating their businesses and raising funding. 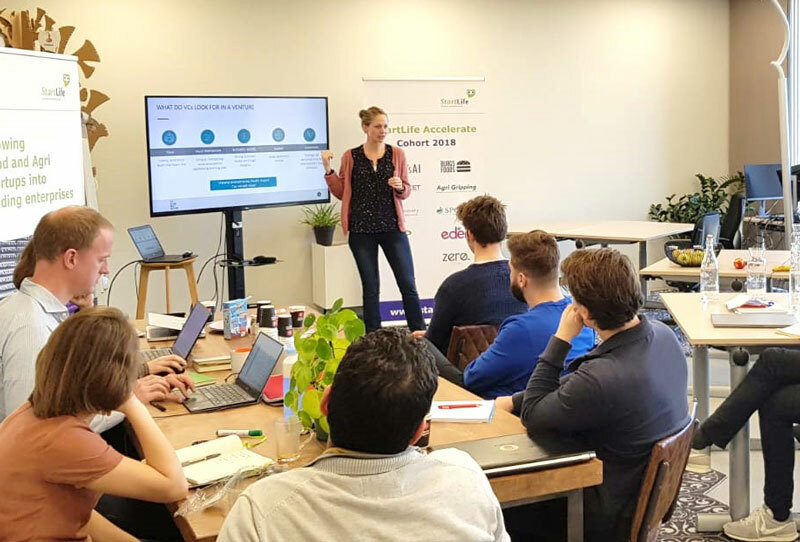 The startups were chosen from over 30 candidates, at the selection day organized by StartLife, March 12 in Wageningen. Establishing a high-performing team, defining your value proposition, developing a go-to-market strategy and delivering a convincing investor pitch and business plan, and negotiating with investors, are just some of the elements that make up StartLife Accelerate both concentrated and effective. The three-month program is uniquely and entirely dedicated to guiding food and agtech startups towards growth and market success. Participants experience a high-quality curriculum and business support from Wageningen University & Research experts, and from qualified trainers and successful entrepreneurs. Each participant receives a €10k soft loan up-front, and €25k after successfully completing the program. The people behind the startup and their personal drive and motivation. The value proposition of their product or technology. The market opportunities and challenges. The presentations were reviewed by the StartLife team together with independent investors. StartLife believes that startups are the propelling force behind the food and agtech innovations required to meet future global food demand. The company fosters entrepreneurship in food and agtech, and supports entrepreneurs in translating innovative business ideas into global enterprises. StartLife collaborates closely with Wageningen University & Research and other knowledge institutes, multinationals, government organizations and investors. Since 2011 it has built, supported and funded 300+ startups, in bringing breakthrough technologies, to market.